If you work outside in the winter or like to head out into adventures in the snow, finding the right pair of socks to wear with your boots is an important decision. Not only do they keep your feet comfortable, but they can also help keep them dry and provide arch support. We researched some of the best products out there and put together this review to help you find the right pair for you. Here are some of the important things to keep in mind. 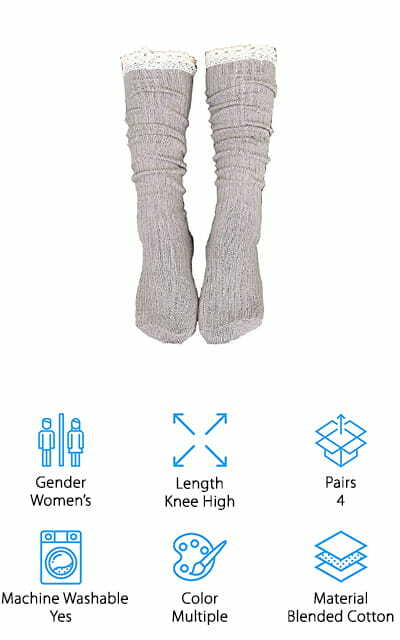 Gender: These socks come in both men’s and women’s styles though there isn’t much difference between them. The biggest thing that sets them apart is that women’s styles are usually available in more colors and styles. 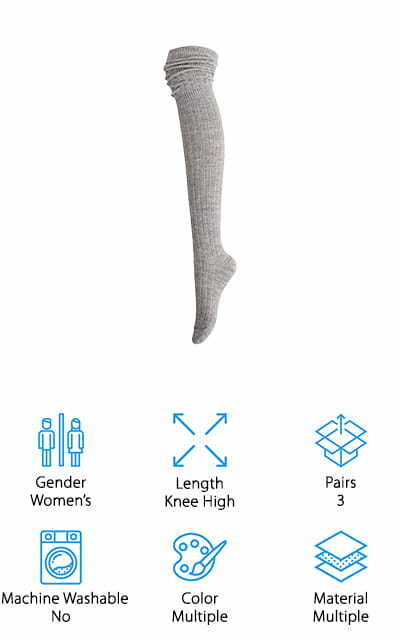 Length: There are 3 different lengths in our reviews, crew, mid-calf, and knee-high. Typically the length that you need depends on how tall your boots are though some of these socks can be folded down and used with other styles of boots. Number of Pairs: All of these socks come in packs of at least 2 and as many as 12. Multi-packs are a good choice when it comes to socks since you need a new pair every day. Machine Washable: Most of these socks are machine washable but there are a few options here that are not. That’s why it’s important to read the washing instructions carefully so your socks last as long as possible. 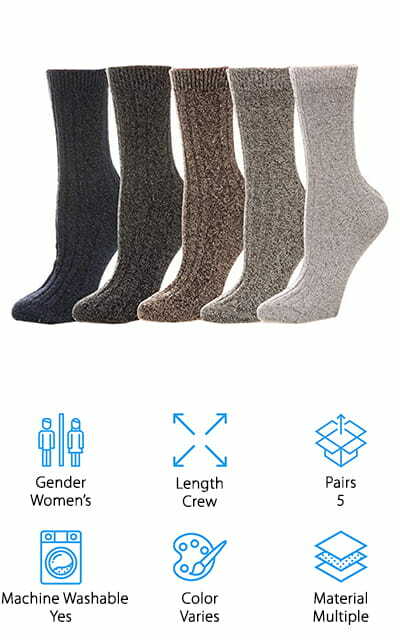 Color: Most of the men’s styles come in basic colors like black, gray, and brown while the women’s socks come in various colors and patterns. Some even have lacey feminine accents around the top for added style. Material: Material varies a bit but these socks are all made using different blends of materials so that they’re soft, comfortable, and durable. Some even have special materials that wick away moisture and keep your feet dry even in the snow. Now that you have a better idea of what to look for, let’s move into our reviews. Here’s how it works. We put our top and budget picks right at the top of the list so that you’ll see them even if you’re in a hurry. That’s the best way to see the range of products available. There are a lot of great options here, though, so stick around as long as you can. Okay, ready? Let’s get started. For a great pair of thick socks for boots, take a look at our top pick, the Carhartt All-Terrain Boot Socks. They’re made of a wool and acrylic blend which makes them the perfect all-terrain boot sock that are great for any season. Not only do they maintain their shape, but they also have a supportive and comfortable bounce. That’s not all, NanoGLIDE reinforcement adds durability and reduces friction to help eliminate blisters. 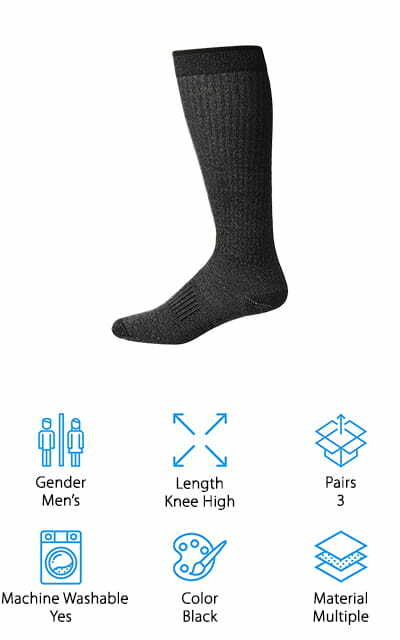 These socks have fast dry technology that wicks away sweat to keep your feet dry and to fight odors to keep your feet fresh. There are also mesh cooling panels and instep channels that promote optimal air flow and breathability. These mid-calf socks are rugged and tough and designed to last as long as your boots. 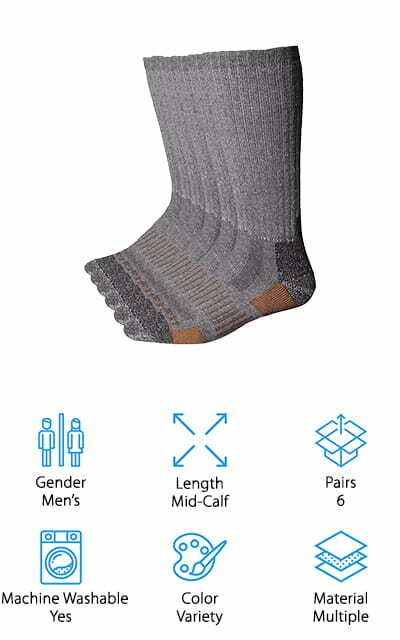 If you’re looking for a great pair of cheap socks for boots, check out the Dickies Moisture Control Socks. They’re made of a cotton and acrylic blend and provide a lot of great benefits at an affordable price. These socks have ventilation channels to enhance airflow as well as arch compression to add support and stability for a better fit. They’re made to last for a long time, too, thanks to the reinforced heel and toe. That’s not all, there are also moisture control fibers to help wick away sweat and keep your feet feeling fresh and dry. These socks are available in multiple colors and come in packs of 6, although if you find that you really love them, you can get them in packs of 12 or 18 as well. The STYLEGAGA Slouch Top Boot Socks are a great choice for long socks for boots if you want something that’s warm, comfortable, and stylish. These socks are a blend of wool, acrylic, Spandex, and nylon that are an ideal thickness while being warm and maintaining a good stretch. While these socks are designed to slouch and be worn above the knee, they will also stay up if you prefer that instead. Because these socks are pretty delicate and should be washed by hand using cold water and a mild detergent and laid flat to dry to keep them in the best condition. They come in packs of 3 pairs and include a pair of black, white, and grey socks. If you don’t want to start with a 3 pack, you can buy each color separately. Next up is the Hunter Women’s 6 Stitch Boot Sock, a great choice if you want the best knee-high socks for boots. One thing that we should mention is that these boots are specially designed to be worn inside the Original Tall Wellington Boot. Not only do they enhance the fit, but they also add a layer of warmth and comfort for cold weather. The leg is made of super-warm 100% polyester fleece and features a fold-down cuff made of six stitch cable knit with the Hunter logo right on the front. There are a few different color options, too. Choose from solid black, solid natural white, black with a grey cuff, natural white with a tan cuff, red with a red and black cuff, and black with a pink and black cuff. 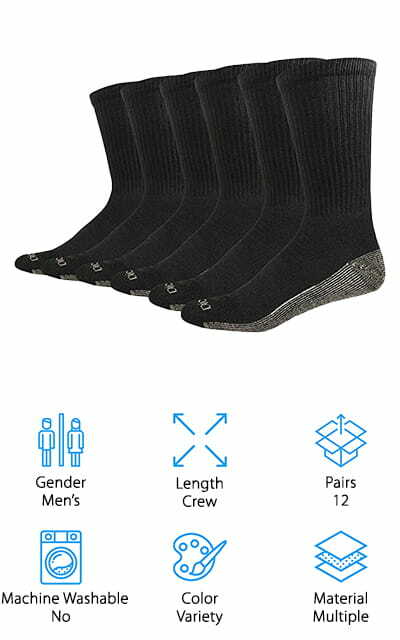 LongGe Wool Crew Socks are really soft and flexible which makes them a comfortable choice. If you’re looking for a good sock for fall or winter, this is it. They’re made of a polyester, acrylic, wool, spandex, and rabbit hair blend and are machine washable. Bear in mind that they’re not dryer friendly so make sure you lay them out flat to air dry. Something really great about these socks is that they come in packs of 5 and there are so many different colors to choose from, 9 different combinations to be specific. Some of them include multiple pairs of neutrals while others include striped patterns and bright solids. That’s not all, they also come with a 100% money back satisfaction guarantee. If you're not satisfied for any reason, just return them for a refund. 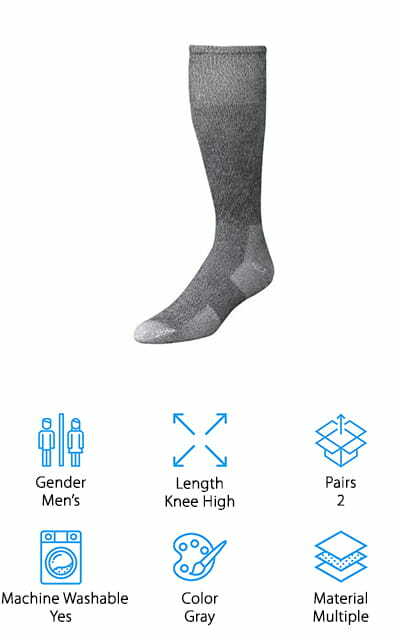 Fruit of the Loom is a well-known brand when it comes to socks and undergarments which is why the brand’s Reinforced Socks are some of the best men's socks for boots we found in our research. They’re a blend of cotton, polyester, and Lycra Spandex that, combined, deliver the perfect amount of comfort, warmth, and stretch. In addition to having a cushioned foot and reinforced sole, they also feature odor control properties that keep them smelling fresh. These are a great pair of socks to wear with work boots because they’re supportive, comfortable, and can stand up to wash after wash. The Spandex helps them stretch and stay snug even when you've been on your feet all day and they perfectly shape to the contours of your foot. They’re available in white, black, and grey. A great set of cute socks for boots is this 4-pack from Gellwhu. These adorable knee socks are made of a cotton blend that’s stretchy and warm but still lets your foot breathe. The vertical ribbing helps prevent slouching though you can wear them folded over if you prefer mid-calf socks. This set comes with 4 different colors, beige, black, coffee, and dark green. That’s a nice mix of options that match just about any outfit. Each color features natural white crochet-style lace around the top for a cute, eye-catching detail that adds a touch of feminity to any boot. These socks are machine washable but it’s recommended that you lay them flat to air dry. Plus, they’re extremely color-fast so you don’t have to worry about them fading from washing or sun exposure. If you’re looking for the best summer socks for boots, give the Wrangler Ultra-Dri Boot Socks a try. They’re made using a blend of polyester, nylon, and spandex and are a bit thinner than some of the other products we reviewed. 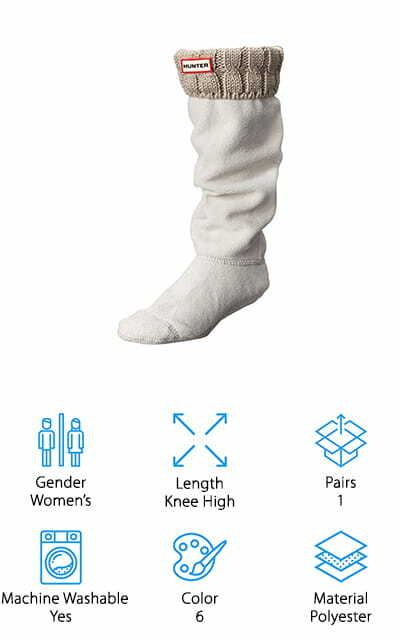 These over-the-calf socks have moisture wicking properties that will help keep your feet dry even when you’re working on a hot day. A full cushion leg and foot provide some arch support for a snug, comfortable fit. That’s not all, they also have a smooth toe seam that prevents any bunching up inside your boot. These socks would work with any boots but are a great pair of socks for work boots. They come in a 3 pack and are available in both black and navy. Plus, they’re machine washable and made in the USA. A good choice if you’re looking for the best thick socks for boots is these Winter Socks for EBMORE. They’re made of a blend of premium cashmere, merino wool, and cotton which makes them some of the best wool socks for boots we found in our research. Not only are they soft, comfortable, and warm, but they also allow your foot to breathe so they’re a good choice for outdoor adventures in the cold and snow. 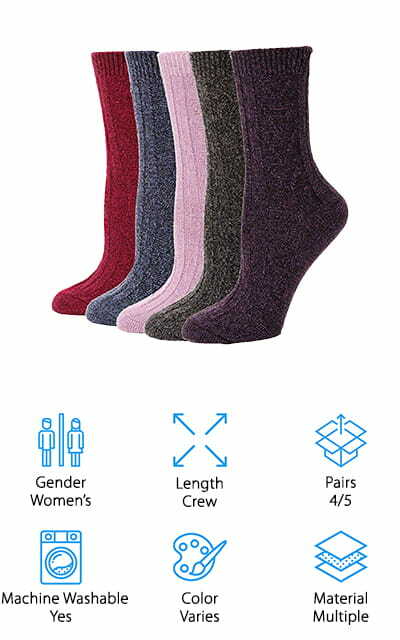 These women’s socks come in packs of 4 or 5 and there’s a nice variety of colors to choose from including black, gray, tan, blue and even a few options with contrasting stripes around the top. You can safely machine wash these socks in cold water but they should be laid flat to air dry. Last but not least in our review is the Wells Lamont Wester Boot Socks. They’re made of blended yarn and Coolwick + Ag yarn that not only wicks away moisture but also provides anti-microbial benefits to control foot odor. Airstrip venting allows your foot to breathe and the built-in arch support keeps them in place and provides comfortable support. One of the nice things about these socks is that they have nylon reinforcement and Spandex in high wear areas to ensure that they’ll last as long as possible. The inside of the socks features terry constructions for soft support without adding any bulk. 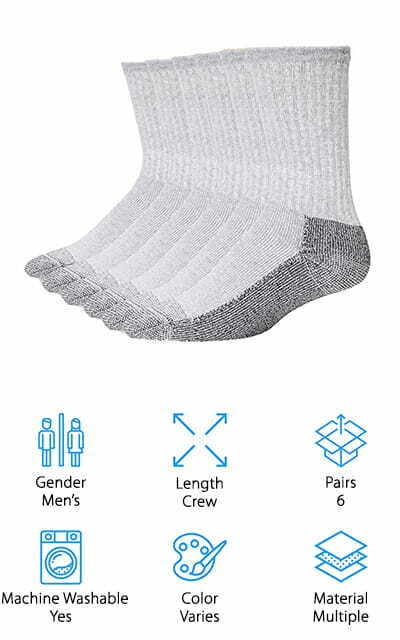 These light grey socks fit men’s sizes 10 to 13 and come in packs of 2. They’re machine washable but should be air dried if possible.